First, the biggest news this week: My latest novel, The Aeronaut, is now available for pre-order in digital formats and will be released in digital and print on November 11, 2015 to commemorate the end of World War I. It's being published by Silence in the Library Publishing. Please click this link and pre-order! 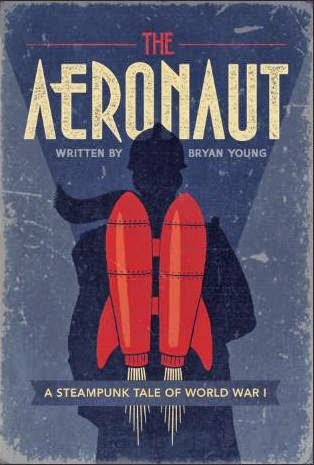 The Aeronaut is a tense story, full of action, espionage, and romance, set in an alternate version of World War I. Computational machinery has allowed both sides to make great technological leaps that have made trench warfare even deadlier for the soldiers at the front. Some men go to war to defend their homeland or to prove something to themselves but Robert Preston has fled America and joined the French Army to escape heartbreak. He's placed in the 5th Aeronautic Corps, an elite unit of the French Army that specializes in jumping over trenches by means of jet packs. It's a dangerous job with a low survival rate, but Preston is determined to make a difference. Along the way, he meets a man he'd call his best friend and a woman he'd call the love of his life, but a top secret mission behind enemy lines and a heart full of jealousy threatens to tear the three of them apart forever. If you're going to get a digital copy, this is the best time for you to do it. For me, anyway. If the book climbs the charts before it even comes out, it's going to help build a momentum that will increase sales for me in the long run. And it's not like you have to pay for it immediately. Like with any pre-order, Amazon won't take your money until the book comes out. I'm so excited to have this book out there. It's been a delicate balancing act and probably the hardest time I've had whipping a novel into shape for publication, but I hope you find the result worth it. This is from a story that's been gestating in my head for a long time and the first draft was finished in 2012. I've written almost four whole novels between now and then and countless short stories, so I'm excited to get this out there. Don't let anyone tell you writing or the world of publishing is a fast process. But I'm proud of what I've done and would love to hear from all of you about what you think. So, please, pre-order the book. And thank you all for the support you've given me over the years. It means more than you can all imagine. I'll be back with some sort of recap of Salt Lake Comic Con, too. But in the meantime, here is my schedule for New York Comic Con. Popular podcasters across geekdom gather to discuss the ins-and-outs of podcasting and answer your questions. Panelists include: Holly Frey and Tracy V. Wilson (Stuff You Missed in History Class), Gregory A. Wilson (Speculate) and Bryan Young, Amy Ratcliffe and the Mike Pilot (Full of Sith). Amy Ratcliffe and Bryan Young will be discussing the state of Star Wars. Tracy and Holly of Stuff You Missed in History Class sit down with author Bryan Young to talk about his book, “A Children's Illustrated History of Presidential Assassination.” The book, illustrated in part by Bryan’s daughter, Scout, includes all the important facts around assassinations (and failed attempts) in a way that manages to be engaging, truthful and witty all at once. As far as my publications for the week, I have a new piece up at StarWars.Com. The Cinema Behind Star Wars: The Third Man. It's a beautiful coincidence that a movie written by one of my favorite writers (and the one who inspired The Aeronaut) is the subject of my column the week the new book went available for preorder. ALSO! : you can get tickets to Stuff You Missed in History Class's first live episode in New York in October (which, coincidentally, will feature me) right here.